Baltaire invokes "warrior and strength" in Celtic, but this contemporary steakhouse is actually chic and sophisticated. 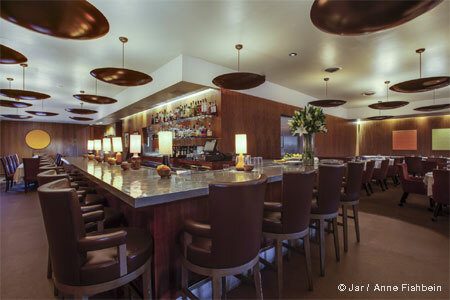 About the restaurant: Baltaire is a steakhouse for the locals, who in this case are ritzy Brentwood residents. The façade and the double-sided fireplace on the street set the tone: modern, elegant and vibrant. Enter to discover a very large and sprawling space with French oak flooring throughout the cocktail bar, the lounge, the dining room, the terrace with its retractable roof, the private room and the wine cellar. View the chef and his culinary team in action through the floor-to-ceiling glass in the aesthetic kitchen. The poised restaurant calls for white table clothes --- and we like that as they tend to disappear more and more these days. Food & Drinks: Now, let us put chef Travis Strickland, an habitué of steakhouse kitchens including Chicago Cut Steakhouse, to work. Start with the salmon belly tartare (a change from the sempiternal tuna one) with avocado, cucumber and crispy fingerlings. If you are into shellfish, you will be satisfied with the oysters of the day, shrimp, Alaskan king crab legs or Maine lobster, each of which can be ordered separately or altogether as a plateau. The Greek salad is prepared table side, while the Caesar, named "Little Gem Caesar," is brought to the table --- another twist. In order to prepare the meat to your liking, Strickland proposes you choose from a porterhouse for two, bone-in rib-eye, Kansas City or New York strip, Prime filet or the very luxurious and decadent A5 Japanese Wagyu. 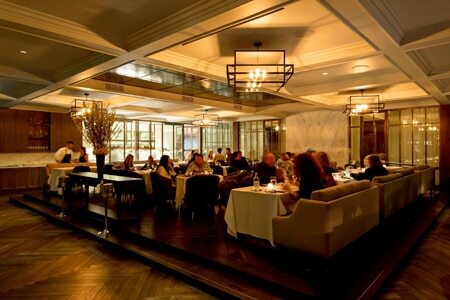 All are cooked on imported French Montague broilers at a radiant heat of 1,600°F. Sauces can be added but the quality of the cuts is so good that, frankly, it is not necessary. Other options include Dover sole filleted and deboned table side in French copper pans, Chilean sea bass, Colorado lamb chops or roast Jidori chicken. For sides, expect to find the usual suspects: lobster macaroni and cheese, creamed spinach, roasted mushrooms (not the best) or olive oil whipped potatoes. Before the sweets (bourbon croissant bread pudding or salted caramel tart), you should ask for a California cheese board. Between the craft cocktails and the hundreds of labels from the wine list, you will not leave thirsty. Wines are served by the glass, half bottles or full, ranging from $45 to $2,500 for Château Margaux 1990.